Sinus infections can be quite awful, followed by manifestations such as headaches and sinus pressure. 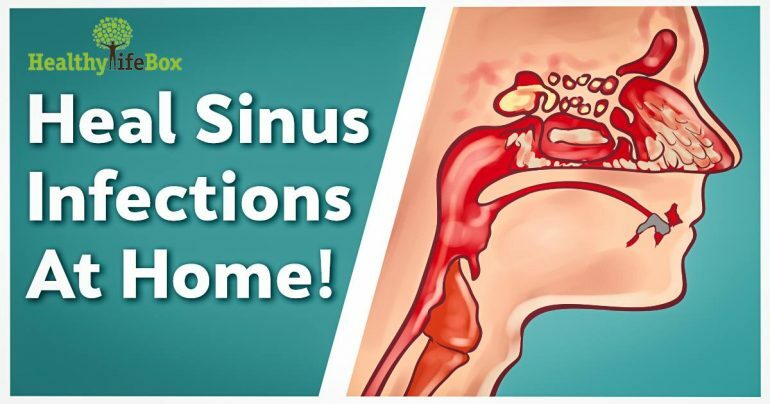 The actual medical term for all kinds of sinus infections and soothes the inflammation of the sinuses and nasal cavities, which can lead to obstructed breathing, pressure, and pain. The causes of this can be viral, allergic, bacterial, and fungal infections. In the initial stages, a sinus infection can be cured without using antibiotics. For starters, you have to rest and consume a lot of fluids and stay away form sugar and caffeine. Mix the apple cider vinegar in some water, and add some honey or stevia to sweeten the taste. Consume this beverage 2-3 times per day. Blend the lemon, garlic, and 1/2 cup of water in the blender. Next, place the mixture in a glass 16 oz. jar, and add the heated water. Place a lid on the jar, and leave it sit for 5 minutes. Strain the mixture in a bigger mug, and add honey to sweeten the taste. Consume the beverage three times daily to get rid of the sinus infection. Arsenicum Album: If you experience a thin, watery, and hurtful discharge, chills and a strong desire for warm drinks, together with anxiety and agitation. Hydrastis: You should use it in the case of thick, foul-smelling, and yellow acrid discharge, raw and burning nasal passages, severe frontal sinus headaches and post nasal drip. Silicea: It helps with nose bleeding, sinus pain, obstructed breathing and nasal sensitivity. Mercurius Iodatus: Use it in the case of yellow or green discharge, tinged with blood, raw and ulcerated nostrils, you perspire a lot, and suffer from extremes of temperatures. Nux Vomica: -It unclogs stuffy passages, frontal head pain, chilly and irritable sensations in reaction to sounds and light. Kalium Bichromium: Use in cases of chronically stuffy frontal sinuses with continuous nasal blockage. Pulsatilla: Helps with thick and yellow nasal dripping and stuffy nose. Hepar Sulph: Utilize only in case of thick, yellow-green, and foul-smelling nasal dripping or blocked nose. It also treats inflamed, red, and swollen nose with insufferable pain, and over-sensitive sinuses and facial bones.